Multi-purpose barns are a great way to go if your needs for additional space and storage are always changing. Multi-purpose barn plans typically have a loft space large enough to stand in and many times they include horse stalls as well. The loft space is designed to withstand fairly heavy loads for feed and other agricultural supplies. Whether you need a building for caring for animals and their supplies, or storing farm equipment, these structures provide you with the flexibility you need. 1150 Sq. 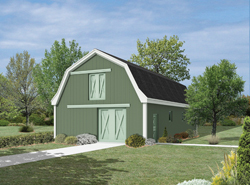 Ft., Width 30'-0", Depth 22'-0"
Our collection of multi-purpose barn plans include many styles and sizes perfect for your farming needs. We offer detailed blueprints that make it easy to picture the finished project built. With a wide variety of plans, we are sure that you will find the perfect do-it-yourself project to fit your needs and style.